Skilled nursing care is a term used to define a range of beneficial care services that are provided for and administered by a licensed nurse. This care service can be very beneficial in promoting better health and wellness, reducing the risk of health complications. This is why it is offered by many home health care providers like our Skilled Nursing in Chillicothe, Ohio. Some medicines must be administered through injections. To administer medicine this way, a license is usually required. With skilled nursing care, a licensed nurse has the capability and expertise to administer such medication for your loved ones. With this service, a skilled nurse will help your loved ones better manage and monitor diabetes. They can help educate on what is the best way to help better live with diabetes and provide assistance in case of complications. This is a valuable service offered by many home health care providers like our Home Health Care Services in Ohio. As we get older, we become more prone to hypertension or high blood pressure. 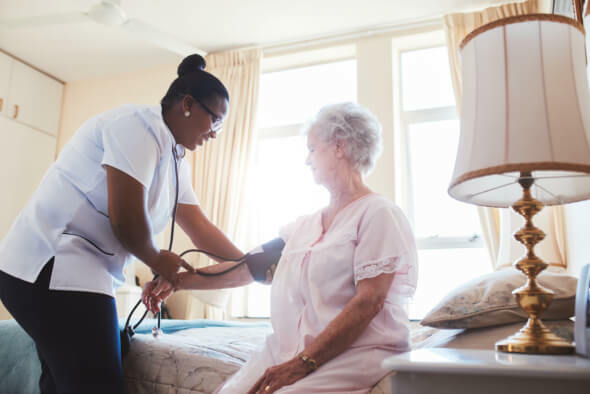 Through skilled nursing care, a nurse will help you monitor your blood pressure regularly in order to promote better health. Those were just a few of the services you could expect from skilled nursing care. We also provide a Home Health Aide in Westerville, Ohio for your loved ones. This entry was posted in Skilled Nursing and tagged Health Care, Home Care, Nursing Care, Senior Care. Bookmark the permalink.